Is henna safe? YES! Natural henna is a safe way to adorn the skin, nails, and hair. Henna has been safely used since 6500 BCE. That being said, there are an awful lot of things being called henna that are not actually henna. Many of these things are NOT safe and can, in fact, be extremely dangerous. Don't worry; this page will teach you to recognize natural safe henna! Stay safe by knowing how to identify "black henna," adulterated henna, disorders that can be effected by henna, and how henna reacts with children. So-called "black henna" is not safe. HENNA IS NOT BLACK! Safe natural henna is applied as a paste that looks black as it dries. It leaves an orange stain that darkens to a red-brown color over a few days. This can be confusing because most online pictures are of the henna paste still on the skin, and the paste looks black as it dries. Henna paste is a khaki green or brown color when wet, but turns black as it dries. That dried paste is then removed to reveal an orange stain. This orange henna stain darkens to a red-brown color over a few days. Below is a picture that shows the natural color progression of henna. Henna stains differently on different people, different skin tones, and different parts of the body. For example, the palms of the hands and the soles of the feet can stain SUPER dark; nearly a black color (you will still see the red undertone of natural henna). This super dark color is only achieved on these areas. On any other part of the body the henna will be the more traditional red-brown color. Henna is darkest on the hands and feet; the further away you get from those areas, the lighter the henna stain becomes. Henna is a transparent color, so it uses the color of your skin as it's base color. On pale skin, henna trends more brown and on darker skin henna trends more maroon or burgundy. This can make it seem like henna is available in various colors, but it's all the same henna. It just looks different under different conditions! Now that you understand what natural henna looks like, let's talk about the product being called black henna. Products being called black henna contain paraphenylenediamine (PPD). Paraphenylenediamine is mixed with henna or other products and called black henna.PPD is also called coal tar, henna stone, and other various names, but no matter the name they are called, they are all PPD. Paraphenylenediamine is a very dangerous chemical and should NEVER be used on the skin. PPD is the chemical in hair dye that is the reason for the warnings plastered all over hair dye boxes, and is the cause of hair dye allergies. In the USA, PPD is legal for use in hair dye on quantities of 6% or less. When used to create black henna, it's in concentrations of 20-70%! Think about that for just a moment. A box of hair dye contains less than 6% PPD, and is covered with warnings about “do a patch test every time you color your hair” and “do not apply hair dye directly to the skin.” Hair dye in general is on the hair for 15-30 minutes. When using PPD for henna, PPD is in concentrations of 20-70%, applied directly to the skin, AND sits on the skin for hours! Aside from being a carcinogen (cancer causing and cancer spreading agent), the big danger with PPD is that it enters your bloodstream and organs, however the liver cannot process it. This means every exposure to PPD is with you forever. Even if you don’t see physical damage such as blisters or scarring, PPD is still causing damage to your internal organs (the liver and the kidneys are most directly effected). As a carcinogen, it is very dangerous for anyone with cancer as it "feeds" and spreads cancel cells. Each exposure also makes it more likely that you will become sensitized to PPD and need to carry an Epi-Pen with you for the rest of your life. 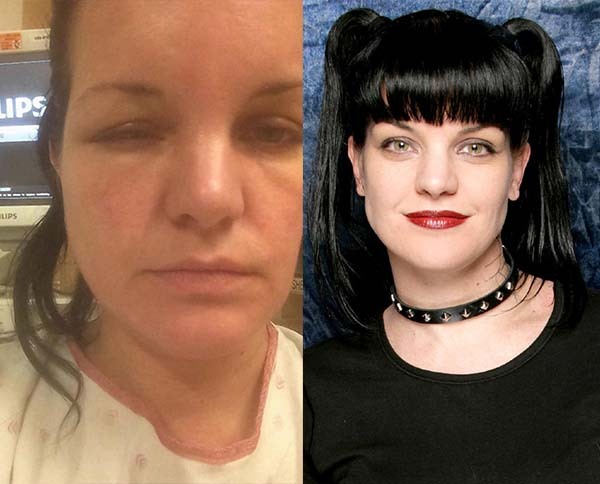 After becoming sensitized to PPD, something as simple as dying your hair can land you in the hospital like Pauley Perrette. Be safe! Only use well-sourced natural henna! PPD, black henna, is not the only dangerous thing that can be added to henna. I understand that we all want darker henna color, quicker and longer, but that is no excuse to use unsafe additives in henna to achieve these goals. Use quality product (henna and oils), follow an easy well-tested henna recipe, and follow good aftercare practices. These best practices will yield excellent henna color; safely. 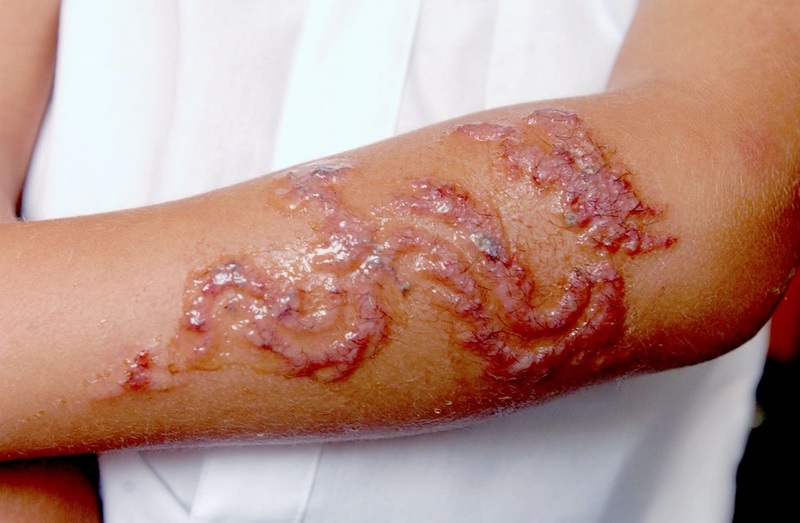 Some of the most unsafe henna additives are benzene, kerosene, and gasoline (among others). In addition to burning the skin, these are carcinogens (cancer causing and cancer spreading agents). These additives can be harder to spot than PPD because they leave a brown or red stain rather than black. These tips will help you be sure the henna is natural. An artist or seller will know the ingredients in their henna, and they will be happy to share that information with you. The ingredients should be things you recognize. Henna paste will smell of the essential oils used in the paste, not like gasoline. Natural henna needs to be left on the skin for a good long time. When first removed, the stain color is orange. Natural henna takes a couple days to darken to a red-brown color. Henna paste must be stored properly. It must be stored frozen. If someone doesn't seem to understand how the science of henna works, do not get henna from them. If in doubt, skip the henna. Is henna safe for children? Sometimes. Is henna safe for babies? Never! Children and babies do not have fully developed immune systems or organs. Their skin is very fragile. The skin is a direct conduit to the blood and organs. In addition to henna, essential oils are hard-core and should NOT be used on infants. If you elect to do henna on children, use a mild oil such as lavender. Henna is not a problem for healthy children over 6 years old. There a couple of disorders that can make henna dangerous for babies, children, and adults: Hyperbilirubinemia and G6PD. In cultures where henna is done often, children are generally tested for these disorders, but here in the USA, we are not. Hyperbilirubinemia can cause severe anemic reaction in children exposed to henna. The younger the child, the more severe the reaction. Hyperbilirubinemia is a disorder where there is too much bilirubin in the blood. Babies are not able to quickly get rid of bilirubin, and henna can cause a build up of bilirubin. Small amounts of bilirubin are not a problem, but large amounts of bilirubin can cause seizures, brain damage, or even death. In an infant, henna can cause bilirubin to be released. If that child has hyperbilirubinemia, her little liver cannot process the bilirubin, and the results can be devastating. Healthy children are no longer susceptible to this by 3 years old or so, when their livers have matured a bit more. Most henna artists do not henna children until they are 6 years old. If a baby was jaundiced at any time, do not henna them. G6PD (glucose-6-phosphate dehydrogenase) deficiency is a disorder than causes anemia. People, both adults and children that have G6PD deficiency should not use henna. The lawsone in the henna will strongly oxidize G6PD deficient blood cells and can cause a haemolytic crisis in both children and adults. People with G6PD should also avoid fava beans, mothballs, some food colorings, and aspirin along with a list of other items. If doing henna on anyone that may be sensitive, only use henna you’ve mixed yourself. Be careful of children between 3-6. I do not personally henna children under 6. If doing henna on children, use a mild essential oil such as lavender. Do not do henna on anyone, adult or child, with G6PD deficiency. Review your ingredient list with everyone before hennaing them.